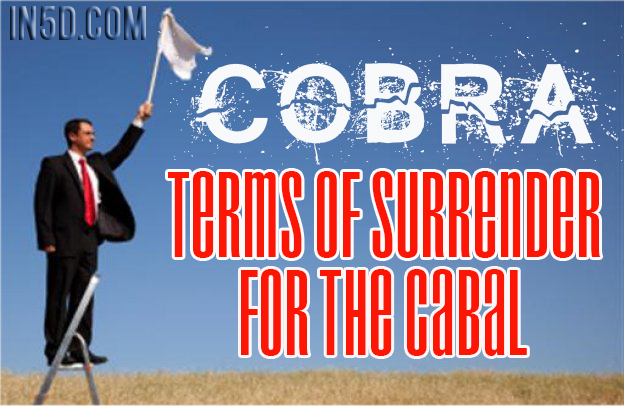 There are Cabal surrender negotiations taking place behind the scenes, and the general population has a right to know what is going on and to communicate their perspective. So here I am putting the terms of surrender for public review and discussion. The Rockefeller faction will most likely fight until their bitter end, but the rest of the Cabal will surrender when it gets unsafe enough for them. Many positive factions are getting increasingly impatient and increasingly capable of removing the Cabal from the planet. Whatever is negotiated with Rothschilds must be negotiated with Jesuits and Black nobility families as well. Chimera group is not involved in these negotiations. The purpose of negotiations is a peaceful transition, and not revenge against the Cabal. They can get assured that they will not be removed from the planet by any of the Earth based factions. They can keep their kitschy castles and lifestyles, but not more, so that amounts to a few billion US dollars. No trillions in bank accounts that could steer the planetary agenda, no control of the media, no access to advanced overunity technology, no position of power whatsoever. They will be integrated into the new society as the ‘Other side of the coin advisers’ and given a chance to reintegrate as ‘Honorable members of the ‘New Society’ after they accept surrender to the Light. They will need to release control over the financial system, the media, the military and the politics worldwide immediately so the Reset can begin peacefully and much needed assistance is given to humanity. They will need to appear in front of truth and reconciliation commission such as the ones in South Africa that were quite successful. They will need to coexist with humanity peacefully. One mistake, and they are removed. These conditions are as favorable as they can possibly get for them. For this reason, many of them will begin to cooperate and actually genuinely accept the Light. Many were forced or born into Illuminati structure against their free will and many are acting out of deep trauma. Those who still refuse to cooperate, will be taken to the Galactic Central Sun after the Event. If they do not cooperate, and cooperate fast, the negotiating conditions may change, because the planetary and cosmic situation will change as the Galactic Central Sun is about to “sneeze”.